Forty years ago, in 1972, it was a classic year for Blaxploitation films and soundtracks. Starting with Super Fly, with a seminal Blaxploitation soundtrack provided by Curtis Mayfield, Across 110th Street was the next big Blaxploitation film, with none other than Bobby Womack providing the soundtrack to the movie. Then later that year, Trouble Man, saw another giant of soul music pen a Blaxploitation soundtrack, Marvin Gaye. This trio of films weren’t the only Blaxploitation films released that year. There was Hit Man, Black Mama, White Mama and Slaughter. However, a Blaxploitation film that crossed movie genres was also released, Blacula which has been rereleased by Revola to commemorate the fortieth anniversary of the film’s release. Blacula was a horror movie, the terrifying tale of an African Prince bitten and taken prisoner by Count Dracula. When he’s released, he goes on to wreak havoc on the denizens of modern day Los Angeles. Written and directed by William Crain, and starring William Marshall, although the film received mixed reviews, it became one of the biggest grossing films of 1973. This lead to Blacula being awarded The Saturn Award, with a sequel Scream, Blacula, Scream following in 1973. After this, many similar Blaxploitation horror films were released. What they didn’t have though, was a soundtrack as good as Blacula’s. Written and composed by Gene Page, Blacula features fourteen funk drenched tracks, including three track from The Hues Corporation. For lovers of funk, crate diggers and sample hunters alike, Blacula is a hidden gem of a soundtrack. I’ll now pick some of the highlights of the Blacula and tell you about them. Opening Blacula is Blacula (The Stalkwalk), which bursts into life, full of energy, drama and plenty of funk. Flutes, keyboards and piano and rhythm section set the scene, before badass wah-wah, guitars and bursts of blazing horns enter. Drums and horns provide drama as Blacula seeks his victim. Meanwhile wah-wah guitars spray their inimitable sound throughout the track as keyboards and piano play leading roles in setting the scene. This adds to the tension and energy of the track, as Gene Page and his band provide a wickedly funky and dramatic backdrop, that funk fans and Blaxploitation lovers alike will adore. There He Is Again is the first of three tracks to feature The Hues Corporation. It’s a track that unfolds at breakneck speed, resembling a chase. It’s as if Blacula is hot on the heels of The Hues Corporation. A frantic, driving rhythm section, stabs of raging horns, wah-wah guitars and vocals that are delivered rapidly and frantically combine. Backing vocals are just as frenzied and impassioned, as the track reveals its dark secrets. This tracks is as far removed from The Hues Corporation’s 1974 hit Rock the Boat as you can get. It’s a frenzied,frenzied energetic fusion of funk, jazz and rock that’s compelling and enthralling. Gene Page returns on Movin’ ninety-seconds of dramatic music. Stabs of blazing horns, wah-wah guitars and a tight, but hugely funky, rhythm section combine with a proliferation of percussion. Later, the rasping horns and rhythm section are key to the dynamic, funk laden backdrop, as wah-wah guitars join the mix, combining to produce a short, but stunning slice of the funkiest music. Main Chance sees the only appearance of the 21st Century Corporation, on a track that has a vocal that’s reminiscent of David Bowie. He’s accompanied by an arrangement that sees soaring backing vocals, percussion and a rhythm section that plays slowly, subtly and thoughtfully. The finishing touch are lush, but sad strings. This results in track that’s beautiful, but thoughtful. Even listening to the sound of Blacula Strikes is enough to strike terror into the heart of anyone whose not a fan of horror movies. Somehow, Gene Page uses this funky band to produce a sound that’s bloodcurdling, haunting and full of tension. Jazzy horns spray their angry sound above the arrangement, while haunting strings add tension and terror. Meanwhile, the wah-wah guitars add to the track’s drama and another important quality…funk. Together, with the rhythm section, percussion and blazing horns, they provide the musical backdrop while Count Blacula stakes his claim on the Prince. Of the fourteen tracks on the Blacula soundtrack, not only is this one drenched in tension and terror, but it’s one of the highlights of the album. I’m Gonna Catch You sees the return of The Hues Corporation, on a track that fuses funk, soul and rock. As bursts of blazing horns and the rhythm section open the track, it’s all change when the vocal enters. It’s delivered with emotion and passion, in a style that fuses rock and soul. The backing vocalists however, add their soulful strains, while rasping horns constantly punctuate the track, augmented by the rhythm section guitars on the album. Together with The Hues Corporation, they provide a powerful, passionate and glorious fusion of soul, funk and rock. Call is a quite different track, one that lacks the frantic, funky sound of previous tracks. Cascading strings, subtle rasping horns, percussion and rhythm section combine to produce a track that meanders beautifully along. It’s a real contrast to previous tracks, the lushness of the music allowing Gene Page to demonstrate another side of his music. This is a brief, beautiful and welcome interlude from the blazing funk that’s gone before and will follow. Wakeeli (Swahili Farewell) is the track that closes Blacula. It’s perfect for the conclusion of the film. It’s full of strings that wouldn’t be out of place in an Alfred Hitchcock film providing tension and terror, while pounding kettle drums add to the drama and anticipation. Then mid-way through the track, it’s full of haunting, tense sounds. Keyboards combine with strings that add atmosphere, before percussion ensures you’re sitting firmly at the edge of your seat. 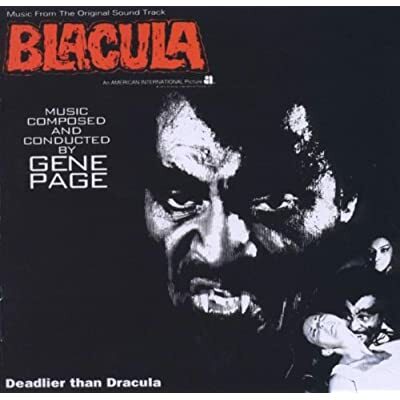 Here, Gene Page uses a variety of instruments to provide an atmospheric, dramatic and haunting end to Blacula. Although I’ve only mentioned eight of the fourteen track on Blacula, there’s nothing whatsoever wrong with any of the other six tracks. Quite the opposite, with music of this quality, it’s difficult trying to pick just a few of the tracks to mention. Here, Gene Page with a little help from The Hues Corporation and the 21st Century Corporation produces a soundtrack for Blacula that’s variously furiously and frantically funky, dramatic and haunting, yet other times thoughtful and introspective. For anyone who loves Blaxploitation film soundtracks, the rerelease of Blacula by Revola to commemorate the fortieth anniversary of its original release is the opportunity to discover an absolute hidden gem of a soundtrack. It’s not just fans of Blaxploitation films that will enjoy this soundtrack. Funk fans, crate-diggers and sample-hunters alike, will welcome the rerelease of classic Blaxploitation soundtrack, featuring some wickedly funky music from Gene Page. After you’ve bought the soundtrack, while not revisit Blacula the movie, only if you dare. Standout Tracks: Blacula (The Stalkwalk), There He Is Again, Movin’ and Call.